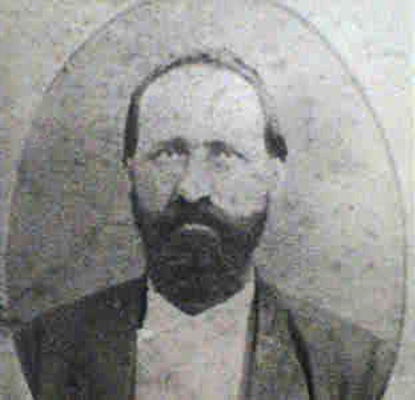 BLEDSOE, Willis Scott - 4th Tennessee (Murray's) Cavalry, Captain of Company F - Willis Scott Bledsoe (PHOTO) was born 5 February 1837 in Claiborne County. He was the son of William Miller and Elizabeth "Betsey" (Trosper) Bledsoe. By 1850, the Bledsoe family moved to Fentress County. In 1860, Willis was admitted to the Bar in Jamestown. He enlisted in 4th Tennessee (Murray's) Cavalry on 10 August 1861 at Camp McGinnis. He was 24 years old at the time of his enlistment and entered the service as a Captain. While serving, he was promoted to Major. He married Susan Frances Harrison on 18 February 1862 in White County, and they had five children. He lost two brothers during the Civil War: Abraham Bledsoe on 24 February 1864 and Captain Robert Henry Bledsoe on 20 March 1864. Fearing reprisals for his participation in the recent war, he and his family moved to Johnson County, Texas about 1867. Along with another brother, Benjamin F. Bledsoe, he opened a law practice. He served in the Texas State Legislature from 1873 to 1874. Willis died on 14 February 1877 and was buried in the Cleburne Memorial Cemetery (See Tombstone). CARTER, George W. - 4th Tennessee (Murray's) Cavalry, Captain of Company A - George W. Carter was born about 1830 in Van Buren County. He was the son of Meredith and Elizabeth (Sisk) Carter. He married Priscilla "Pressy" Lewis on 7 June 1849 in Van Buren County, and they had five children. He enlisted 14 June 1862 in Chattanooga and became the Captain of Company A. He was also a member of 13th Tennessee (Gore's) Cavalry, but there is very little information about his service in this unit. By the end of 1863, he was leading a guerrilla unit operating in the Middle Tennessee region. George was killed at the First Battle of Saltville on 2 October 1864. He is buried in the Emory & Henry Cemetery in Washington County, Virginia (See Tombstone). FERGUSON, Champ - Confederate Guerrilla - Samuel Champion "Champ" Ferguson (PHOTO) was born on 29 November 1821 in Clinton County, Kentucky. He was the son of William R. and Zilphia (Huff) Ferguson. He married Anna Elizabeth Smith on 12 May 1844, and they had one child. Both mother and child died in 1847. Champ then married Martha Owens on 23 July 1848, and they had one daughter, Ann Elizabeth. After 1860, the family moved to White County, Tennessee. Champ was described as "... about six feet high, and weighs 180 pounds, without any surplus flex. He has a large foot, and gives his legs a loose sling in walking, with his toes turned out -- is a little stooped, with his head down. He has long arms and large hands, broad round shoulders, skin rather dark, black hair a little curled, a broad face, large mouth, and a tremendous voice, which can be heard at a long distance when in a rage." 1 At the outbreak of the war, Champ raised his own regiment of men to engage in guerrilla activities in Tennessee and Kentucky. Although he was addressed as "Captain," he was usually not attached to the Confederate Army and conducted his own operations independently. 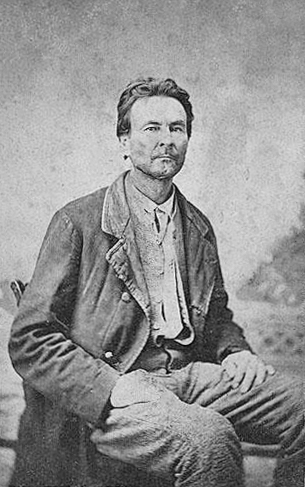 The Union army considered him an outlaw and relentlessly pursued him to capture or kill him. After the war officially ended, Champ was taken into Federal custody on 23 May 1865 in Sparta. While Champ claimed that he had surrendered, Colonel Joseph Blackburn insisted that Champ was captured. He was charged with the murders of over 50 men. From 11 July - 26 September 1865, his military trial was held in Nashville. On 10 October 1865, he was declared guilty and sentenced to death by hanging. On Friday 20 October 1865 in Nashville, Champ Ferguson was hung while his wife Martha and sixteen-year-old daughter Ann watched. His remains were carried to Sparta and interred in the France Cemetery (See Tombstone). GATEWOOD, John P. - 4th Tennessee (Murray's) Cavalry, Company F - John Pemberton Gatewood was born about 1845-1847 in Fentress County. He was the son Pemberton and Nancy (Rhea) Gatewood. At the outbreak of the Civil War, he was just a boy of about 15-17 years old. On 10 August 1861, John and two of his brothers, James H. and Berry, enlisted in 4th Tennessee Cavalry at Camp McGinnis. Later, two other brothers William and Milton enlisted in the Confederate army. Milton enlisted in 8th Tennessee (Smith's) Cavalry, and William enlisted in the 4th Tennessee (Murray's) Cavalry and 8th Tennessee (Smith's) Cavalry. By the time John enlisted, he was described as six feet tall, over 200 pounds with a muscular and athletic build, locks of bright red hair that hung below his shoulders, and bright blue eyes. In January 1863, he returned to Fentress County to visit his family. Although the details are sketchy, it is believed that John left the Confederate army after only 18 months of service to engage in guerilla activities, because one of his sisters was brutally raped by a Union sympathizer. He wanted to avenge his sister. Regardless of his reasons, it was at this time that he embarked on his new career path. After the war, many members of the Gatewood family migrated to Johnson and Ellis Counties in Texas. Possibly fearing reprisals for his acts during the Civil War, John began using the alias P. M. Gatewood. On 11 August 1872, John married Mary Amelia Shumate in Smith County, Texas. During their brief marriage and while Mary was pregnant with their daughter, it was rumored that John carried on an affair with a prostitute named Jessie May. On 10 September 1874, Mary gave birth to a daughter whom she named Emma. In January 1875, she filed for divorce citing adultery and abandonment. It is unknown when and where John died. However, when his daughter filed for membership in the Texas division of the United Daughters of the Confederacy, she listed 3 June 1875 as the date her father died. 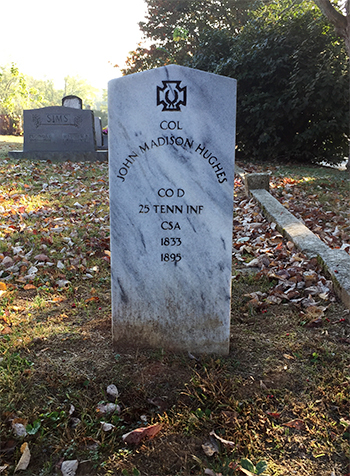 HUGHES, John M. - Colonel of the 25th Tennessee Infantry, Company D - John Madison Hughes (PHOTO) was born about 1832 in Tennessee. He was the son of John Hiram and Catherine (Morrison) Hughes. He married Sarah Dillon about 1856. By the outbreak of the Civil War, John and Sarah had a daughter and a son. At the age of 29, John enlisted on 1 August 1861 in Livingston. During the Battle of Murfreesboro in December 1862, he was slightly wounded in the head. 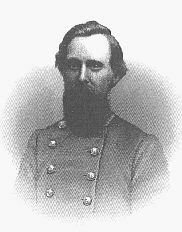 He was appointed Colonel of the 25th Tennessee Infantry on 8 July 1863. Just after August 1863, he was assigned to detached duty recruiting men for the Confederate service, and he was cut off from his command by the Union army. He began organizing guerilla operations against the Federal Army in Middle Tennessee. "Col. John M. Hughes was one of the most gallant, faithful and effective officers in the Confederate Service. He was stout. active, and an athletic man and one of the best marksman in the Confederate Army with a pistol or long range gun. He was brave, cool, cautious, discreet and untiring and ever on alert. He handled his fire arms in the blaze of battle with the same coolness, care and accuracy as upon the drilling or hunting ground. Calm and self-possessed under every emergency, quick to adapt and always ready to execute the most daring and hazardous stratagems, he seemed to court peril and danger and no doubt sent the death ball home to more of the enemy than any other man who used small arms in the service. " After the end of the war, he and his wife Sarah settled in Lincoln County. They had three more sons. Sarah died on 27 August 1874 in Lynchburg. He married Mrs. Alice J. Mallory on 28 July 1875 in Rutherford County. He owned a distillery, lumber business and tannery. He was also a business partner to the famous Jack Daniels. John died on 10 April 1898 [his tombstone says 1895] and was buried next to his first wife in the Lynchburg Cemetery in Moore County (See Tombstone) . On 17 July 2012, John Madison Hughes was honored on Confederate Memorial Day at the Winchester Cemetery in Moore County (See News Article). STEAKLEY, Wiley - 4th Tennessee (Murray's) Cavalry, Company A and 1st Confederate Cavalry, Company D - Wiley L. Steakley (PHOTO) was born 23 February 1844 in Van Buren County. He was the son of Wiley L. and Priscilla (Lewis) Steakley. His father was a Sheriff of Van Buren County. On 14 June 1862, Wiley enlisted in the 4th Tennessee Cavalry at Chattanooga. His brothers, James, Pinkney and William enlisted in the Confederate army, as well. Wiley was present for duty from 14 August 1862 to 23 January 1863 in the 4th Tennessee Cavalry. From 23 January - 30 April 1863, he was present for duty in the 1st Confederate Cavalry. Wiley was credited as being the first soldier to fire shots during the Battle of Dug Hill. In his application for Confederate pension, he claimed he had participated in the following battles: Perryville, Murfreesboro, Ft. Donaldson, Shelbyville, and Chickamauga. He had three horses shot from under him and was taken as a prisoner of war. On 16 January 1870, he married Lavinia Elizabeth "Vina" Sparkman in Overton County, and they settled near Bone Cave in Van Buren County. They had nine children. On 26 August 1869, Wiley and John Templeton killed Meredith "Bud" Carter just outside Jim Clark's drinking shop in Van Buren County. Earlier that year, Wiley and Doc Charles (a brother-in-law to Templeton) assisted in the unsuccessful apprehension of the notorious horse-thief Bud Carter in Alabama. After getting away, Carter repeatedly issued death threats against Wiley and Charles. Knowing full well that Carter would carry through with his threats, the men carried a gun at all times. On the night of 26 August, Wiley and Templeton tracked Carter to Jim Clark's business. They concealed themselves nearby until Carter rode up. As Carter dismounted, Wiley and Templeton seized their opportunity and fired double-barrel shotguns at Carter. Carter fell with the first shot but was able return three shots. As Carter lay on the ground begging for his life, Wiley shot him a final time. Neither Wiley nor Templeton were arrested for the crime. In 1892-1893, Wiley served as the Post Master at Camp Ground in White County. 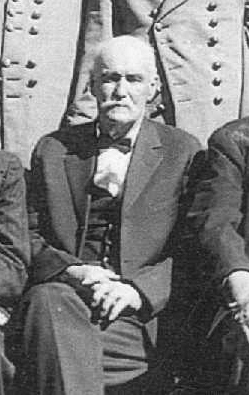 In 1928, Wiley served as the Colonel of Infantry of the Confederate Veterans of Sparta and White County. In June 1929, Wiley applied for and received a Confederate Pension from the state of Tennessee. He lost his wife on 12 June 1932. When he reached his 90s, family and friends held yearly birthday parties to celebrate his age. Wiley was the last surviving Confederate veteran of White County. He died 21 June 1941 and was buried next to his wife in the Greenwood Cemetery (See Tombstone).